We're back once again with our periodic series looking at computer hardware market trends, this time taking a look at GPU sales for Q2 2016. 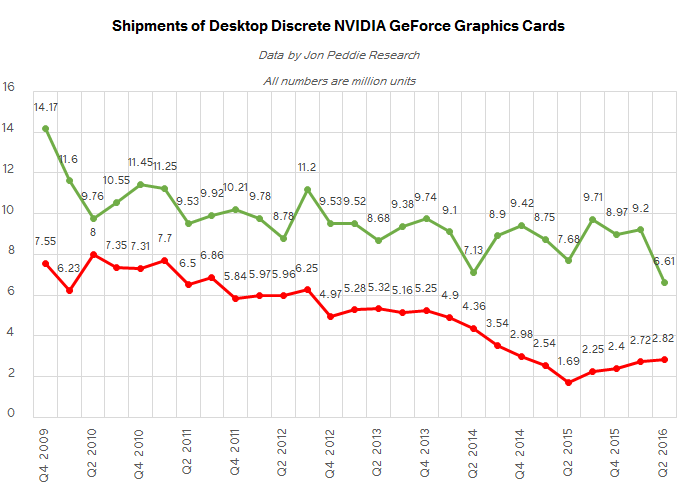 Broadly speaking, unit sales of discrete desktop graphics cards are traditionally not strong in the second quarter. This year was not an exception, and shipments of video cards nearly hit a multi-year low after dropping by around 20.8% from the previous quarter, according to Jon Peddie Research (JPR). During the quarter, AMD managed to slightly improve its shipments and gained market share, whereas NVIDIA’s sales of desktop discrete GPUs were down in terms of units. Nonetheless, the latter still commands the lion’s share of the market. Before we look at the numbers for Q2 2016, we should take a short look back to understand what is happening on the market of discrete GPUs and why it is transforming nowadays the way it is transforming. While integrated GPUs have been around for the better part of a decade and a half now, it's really only in the last 5 years or so that they've been a first class citizen in the desktop market. Integrated GPUs have always eaten away at discrete sales - the peak for discrete card sales was back in 1999 at 114M units - but it's when they became useful for more than basic texts and spreadsheets that they more heavily impinged on the discrete market. The catalyst for this change was when Intel integrated their GPU into their CPU itself in 2010 with Sandy Bridge. By moving the GPU to a leading-edge process and by allocating ever-greater transistor budgets and die space to its various blocks, performance of their iGPUs started to increase rapidly. Today, higher-end Intel’s iGPUs can successfully compete against entry-level discrete GPUs, severely curtailing the sub-$100 discrete GPU market and significantly shrinking total available market (TAM) of standalone cards. For example, in 2006, the industry sold approximately 84.65 million desktop discrete add-in graphics boards. However, unit sales of such components in 2015 dropped to about 44 million units, according to JPR. Even though iGPUs may eventually replace affordable video cards, high-end discrete GPUs continue to gain horsepower every year and their level of performance is miles ahead of iGPUs. Moreover, the population of gamers who need advanced graphics add-in-boards (AIBs) to play their favorite titles has grown. As a result, while the TAM of standalone GPUs is shrinking, the demand for high-performance graphics cards is growing; the market is (broadly) shifting towards a more enthusiast-centric market. In the recent years shipments of high-end desktop GPUs totaled around 2.8 – 3 million units per year (2.9 million in 2014), but in 2015 sales of such products increased to 5.9 million units. 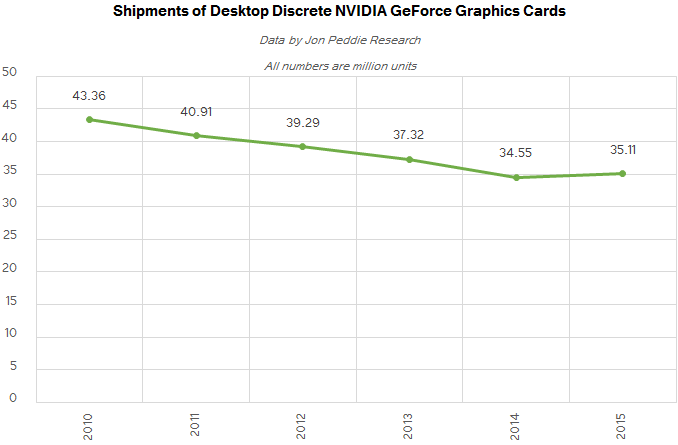 It is impossible to tell when unit sales of desktop discrete video cards hit the bottom and demand for high-end graphics cards peaks. There are still millions of low-end discrete desktop graphics cards sold every year and it does not look like they are going to disappear overnight. But given the current trends, it is clear that developers of discrete GPUs tend to invest more in development of mainstream and high-end processors and less in creation of entry-level chips. In the second quarter of 2016, the industry sold between 62.4 million and 64.3 million PCs, according to IDC and Gartner respectively. Meanwhile, discrete GPUs were used in 27.78% of PCs, claims JPR. Since the latter does not disclose its overall PC numbers, we can only estimate that shipments of discrete GPUs (for desktops and notebooks) were between 17.33 and 17.86 million units, based on the numbers from IDC and Gartner. 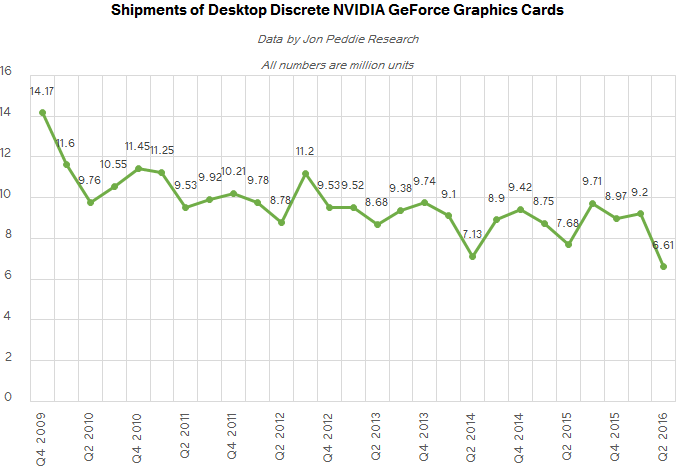 Jon Peddie Research estimates that shipments of standalone GPUs in Q2 2016 were down 14.19% from the previous quarter, and decreased 1.03% from Q2 2015. While unit sales of PCs in general were down year-over-year – between 4.5% and 5.2% depending on whose numbers you use – their shipments did not decrease from Q1 2016. According to Gartner, they remained on the same level and according to IDC they actually increased by nearly two million units. Moreover, JPR claims that unit sales of desktops were up 2.5% quarter-over-quarter (QoQ). 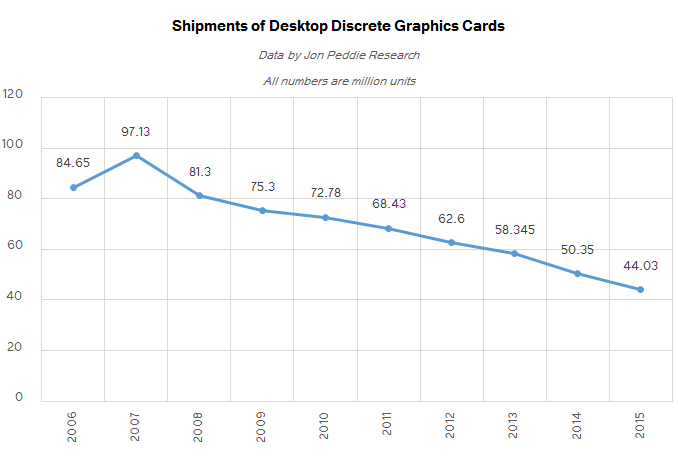 But despite relatively strong demand for desktops, shipments of discrete video cards for such PCs declined by 20.8% quarter over quarter, but increased by 0.8% year-over-year, based on data from JPR. Numbers are in percentage points or in millions. Numbers are approximate. 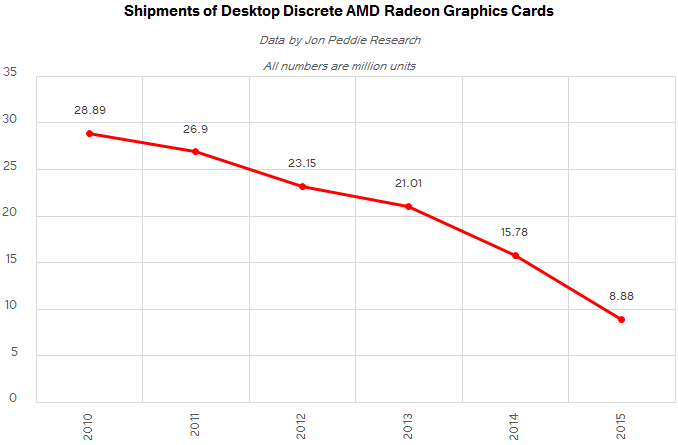 Jon Peddie Research does not officially disclose how many graphics adapters for desktop PCs were sold in Q2 2016, but based on the company’s previously released numbers, we can estimate that various makers of AIBs sold approximately 9.44 million video cards, which is slightly up from 9.38 million units in Q2 2015 (see notes below). As pointed out above, the second quarter is seasonally not good for unit sales of desktop discrete GPUs. However, it looks like 2016 seems to be shaping up well for AIBs in general: unit sales of desktop video cards in Q1 were 11.92 million (up from 11.3 million in the same period a year ago) and in Q2 they totaled 9.44 million units. If our estimates of JPR’s data are correct, then shipments of desktop discrete GPUs in 1H 2016 increased by approximately 3% YoY to 21.36 million units (which means that AIB suppliers sold at least 650K more graphics cards than in 1H 2015). Historically, AMD commanded 35 – 40% of the discrete desktop GPU market. 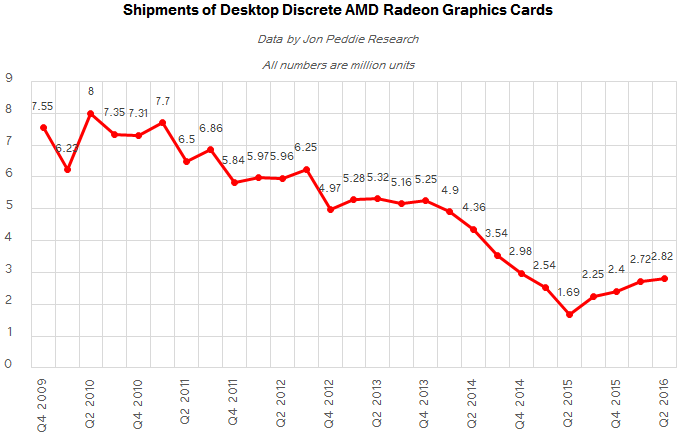 Things started to turn south for AMD in Q3 2014 both in terms of shipments and share. By Q2 2015, the company’s share dropped to 18% and unit sales of standalone GPUs for desktops declined to 1.69 million units. By contrast, NVIDIA was thriving: its share increased to as high as 82% in Q2 2015, but since the market was shrinking its shipments did not grow very significantly. To regain market presence, AMD had to clear-out old inventory and address niche markets with products like the Radeon R9 Nano. The measures along with low base effect helped the company to demonstrate steady growth of desktop GPU shipments over the past 12 months. Seasonality did not affect AMD in Q2 2016 and the company managed to increase its shipments by ~100 thousand of units (if our estimates are correct). Unlike its rival, NVIDIA was affected by seasonality in the second quarter, and likely anticipation of its Q2/Q3 product launches. Moreover, the company decided to clear out some of the inventory of older model cards amid the launch of Pascal-based GeForce 1070 and 1080 graphics cards, according to JPR. This greatly affected actual shipments and market share of NVIDIA: unit sales decreased by 14% YoY and by 28% QoQ, whereas market share declined to 70%. AMD sold approximately 5.5 million of desktop discrete GPUs in the first half of 2016, up from about 4.2 million in the same period a year ago. 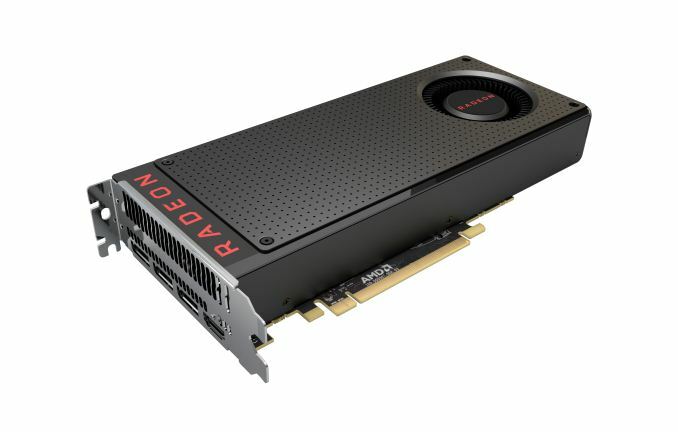 The company’s management says that the recent introduction of its Polaris-based Radeon RX 470 and 480 GPUs helped it to increase unit sales of graphics cards in the channel in Q2. Besides, revived interest for crypto currency mining using GPUs also helped AMD to sell more Radeon cards in the first half of the year. Since AMD doesn't break out its GPU revenues from the larger financial results of its Computer and Graphics Group, we cannot say how significantly the company improved its financial results by selling more chips/cards in the second quarter. Strong mainstream offerings like the aforementioned Radeon RX 470/480 graphics cards could help AMD to further increase shipments of desktop AIBs in the coming months. The company admits that to further boost unit sales, it needs more chips from GlobalFoundries, but it assures that their yields are improving. A good news for AMD is that unit sales of discrete desktop video cards in the second half of the year are traditionally higher than in the first half. Therefore, if everything goes well and the company manages to capitalize on its Polaris architecture, it has chances to sell more standalone desktop GPUs in 2016 than it did in 2015. From a volume perspective, sales of NVIDIA’s standalone GPUs for desktops decreased in the first half of 2016 in general (to ~15.81 million units, down 4% YoY) and in the second quarter in particular (to ~6.61 million units, down 14% YoY and 22.2% QoQ). A big drop of unit shipments caused a natural decline of the company’s market share. However, lower unit sales do not always translate into poor financial results. If we take a look at NVIDIA’s financial results for Q2 FY2017 (started on May 2, ended on July 31, so it is not exactly calendar Q2), we will notice a 18% YoY and a 13% QoQ increase in the company’s gaming GPU revenue. 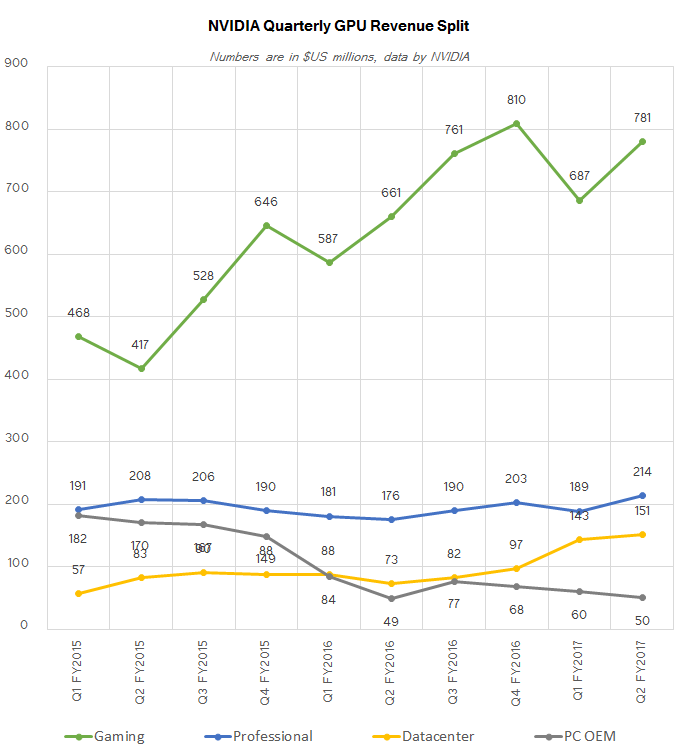 While it is not exactly right to compare calendar Q2 with NVIDIA’s Q2 FY2017, even such comparison gives us an idea what happened in April – July period. Since demand for discrete graphics adapters by mainstream users in Q2 is not strong, the company decided to clear out its older inventory and not pursue volume shipments, but focus on ramping up new Pascal-based products. This clearly cost the company a lot from the market share point of view, but to a certain degree, it stimulated demand for higher-end Pascal video cards by gamers. Since the new GeForce GTX cards command a significant price premium, NVIDIA naturally improved its earnings during the quarter. Demand for NVIDIA’s latest video cards was very high and many observers reported shortages of the new AIBs. The company claims that yields of its GPUs produced using TSMC’s second-gen 16 nm FinFET process technology (CLN16FF+) are going to improve, which will clearly amplify its supply. Even though Q2 2016 was not very good for NVIDIA from unit sales point of view, the second half of the year is going to be better in general. The company will try to capitalize on its comprehensive lineup of mainstream and high-end GPU offerings based on its Pascal architecture. In fact, due to the launch of two GeForce GTX 1060 SKUs in Q3, unit sales of Pascal-based products will inevitably be higher this quarter compared to Q2. However, it remains to be seen whether the company manages to sustain its annual GPU unit sales at ~35 million this year. 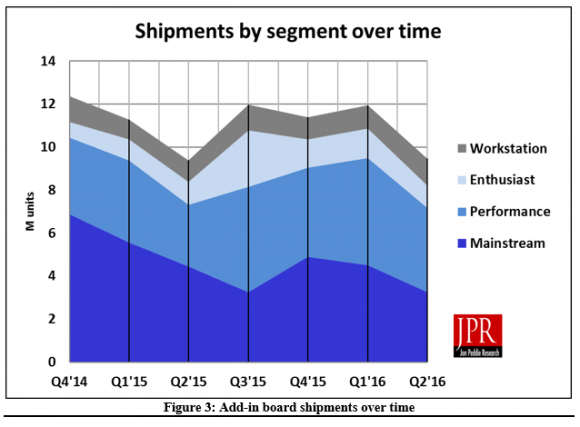 Despite relatively weak shipments of PCs in 2016, unit sales of discrete desktop graphics cards in the first half of this year are actually higher that unit sales of such products in the same period a year ago. Declines of AMD Radeon sales seem to be over, but the company still has to do a lot to re-capture lost share from NVIDIA. In Q2 AMD managed to sell approximately 2.8 million of desktop AIBs and commanded 29.9% of the market. However, with 6.6 million discrete desktop GPUs sold in the second quarter and 70% share, NVIDIA remains the leader in this segment of the market despite significant drop of its unit shipments. Integrated graphics is slowly shrinking TAM of standalone GPUs. For now, sales of entry-level graphics processors are still relatively decent, but going forward unit sales of such products will continue to drop. By contrast, sales of high-end desktop AIBs are on the rise, and last year has seen both AMD and NVIDIA benefit from that. Enthusiasts are still a small part of the big picture, but as GPU prices and sales patterns continue to drift towards the high end, they are an increasingly critical part of the picture. 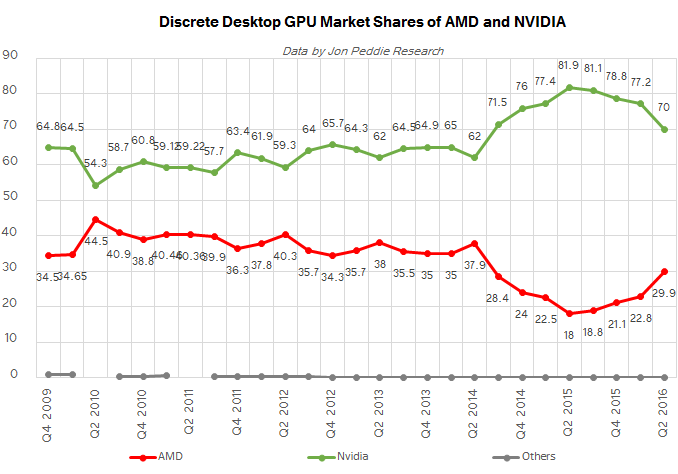 Jon Peddie Research does not officially disclose actual unit sales of AMD, NVIDIA and Intel in its press releases. All unit sales published here are derived from market shares of appropriate vendors. Since in many cases JPR does not disclose quarterly TAM numbers, those numbers are derived from historical numbers published by the company. Some historical numbers were re-stated by IHVs and JPR reflected such updates in subsequent reports and releases. As such, some numbers in our graphs may differ from publicly available press releases. 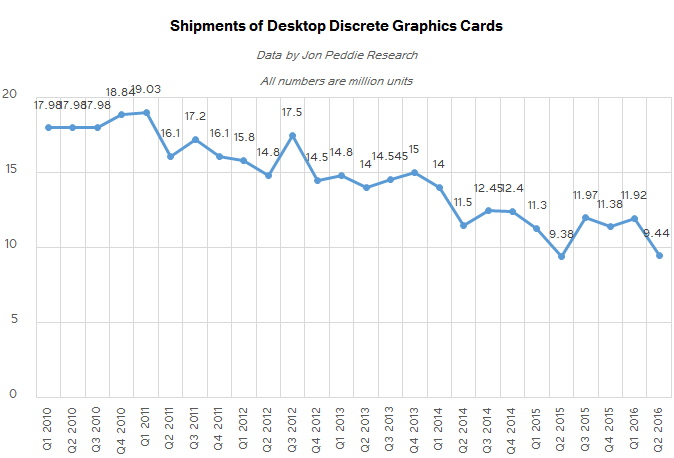 JPR did not release any data concerning sales of desktop discrete graphics cards in Q1 – Q3 2010, but only disclosed shipments for Q4 and total shipments for the year, which is why the numbers in the charts for Q1, Q2 and Q3 are the same. Given the fact that unit sales and TAM figures are approximate, we recommend to buy full reports from Jon Peddie Research if you need the data for decision-making. Odd, apparently AMD's selling more GPUs now than in a long time, but I _still_ cannot find a new RX 480 4GB for the MSRP of $200. Every once in a while one will drop to $234.99, but that's just under the EX 480 8GB MSRP of $240. In these graphs, what does Q2 refer to? April, May and June? Because Polaris was launched on June 29th IIRC so would have had very little effect on these results. And this is also true for Pascal. Ethereum and a bunch of small alt-coins. It should be noted that the main reason for Ethereum's value (ether) is the fact that it provides a general purpose blockchain technology that allows for smart contracts. Basically someone writes an Ethereum script--the contract--all parties agree and it's basically "set in stone" in the ether so to speak. One of the interesting parts is that the script can be connected to physical devices as well. ... with $5 shipping. So again, $234.99.